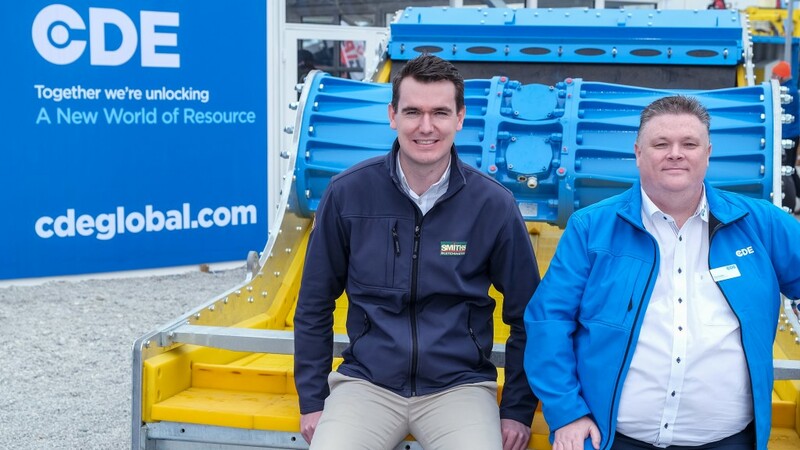 Pictured at bauma 2019 are Ben Strickland, Quarry Manager at Gill Mill Quarry and Recycling, and Tom Houston, Director of CustomCare at CDE. Launched at bauma 2019, Intelligent Plant, CDE's pioneering next generation technology, utilizes advances in machine learning and the Internet of Things (IoT) to monitor and automate previously manual processes. Enabling the plant to make smart decisions in real time, Intelligent Plant can boost productivity by up to 40 percent with a payback period of under six months. Tom Houston, Director of CustomCare at CDE, said: "We are constantly striving for innovations to help customers maximize output with minimum effort. Intelligent Plant has created thinking plants that reduce downtime, maintenance and fixed costs while increasing yield and revenues for plant owners by almost half - and in some cases even more." The world’s largest wet processing plant for C&D waste, situated alongside the company’s natural sand and aggregates processing plant, at Velde Pukk in Stavanger, Norway utilises CDE Intelligent Plant technology and has seen a significant increase in output.